Clif Bar had a few new products to show at the Winter Bike Press Camp event last week including something completely different – pizza in a pouch! Clif Bar has launched a new line of Organic Energy Food with four brand new products that are made from simpler organic ingredients. They worked with top athletes including runners, climbers and cyclists to create a product that is high quality with real food ingredients. The four new product fall into two categories: sweet and savory. The sweet is similar to gel to be used when going a bit harder and you need carbs and a little bit of sodium. Most normal gels have a high glycemic index, these have a more moderate glycemic index since they are more natural and take a bit longer to absorb. Textural, they are made from real foods so they feel and taste more like real food and they contain only six ingredients. Beet sugar is the main source of sugar, which is popular these days. The coconut flavor has real bits of coconut shreds for a more natural texture as well. 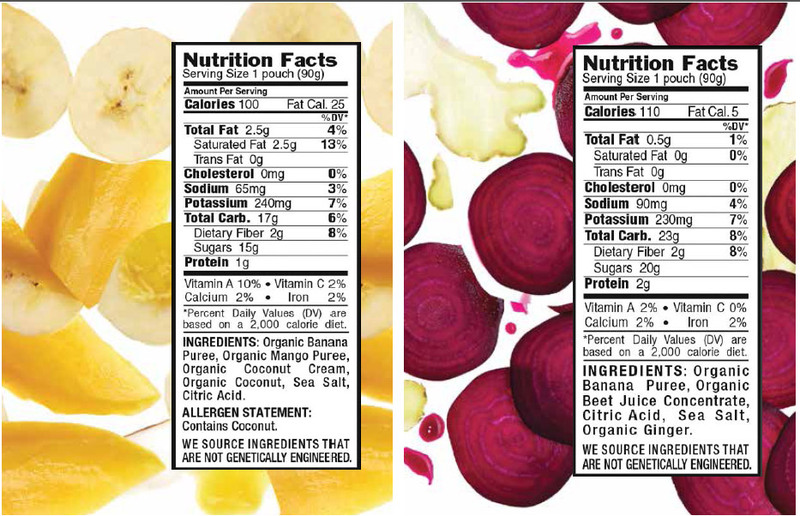 The two flavors are Banana Mango with Coconut and Banana Beet with Ginger and they are USDA Organic, gluten-free and kosher. They come in a 90 gram pouch and sell for $2.29 retail. Clif Bar started out on this project with the sweet potato and sea salt flavor. They went with sweet potatoes because they have more nutrition than white potatoes and high levels of vitamin A and other micro-nutrients. Sun flower seed butter and olive oil gives a light serving of protein and fat (as a dense energy source). The Pizza Margherita flavor came about because the folks at Clif asked people what they crave after long, hard efforts and they consistently heard “a slice of pizza” as a popular response. Cheese pizza is a good choice because it has the fat, sodium, protein and carbohydrates. 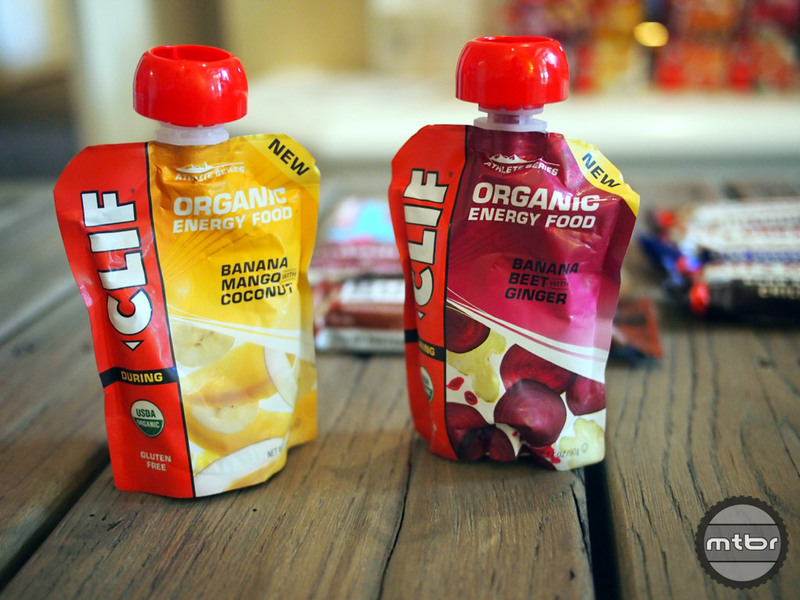 Clif’s food developers were challenged to create a recipe that could produce this flavor. Not only are there carbs from tomato puree and carrot puree but there’s also quinoa flakes which yields a bready, crust note and then they use yeast flakes to get the cheese note. Randall says, “One of our ultra athletes, Scott Jurek is a vegan and insisted on a vegan friendly version. There is almost no dairy, no cheese. Initial feedback has been really good.” The Sweet Potato with Sea Salt and the Pizza Margherita are also USDA Organic, gluten-free and kosher (they contain very little to no dairy, but due to cross contamination with other dairy products these are not certified as non-dairy). As a point of interest for cyclists, who may want to eat these while still on the bike, Clif suggests two things. One, you can twist and open the seal on the cap before your ride, so that it will be easy to open while riding. Also, they have found that you can remove the cap completely and a hydration pack bite valve will actually fit directly on the neck of the pouch itself, allowing the rider to eat these with one hand. All four of these new flavors can be drawn through the bite valve. Of course, be sure to wash your bite valve throrougly post ride. We asked about the girth of the plastic cap. It seems like quite a bit of plastic and we hate to see any more plastic being created than necessary. Randall responded by saying that they are actually working on a new cap that will reduce the amount of plastic used as well as give a better grip while opening. 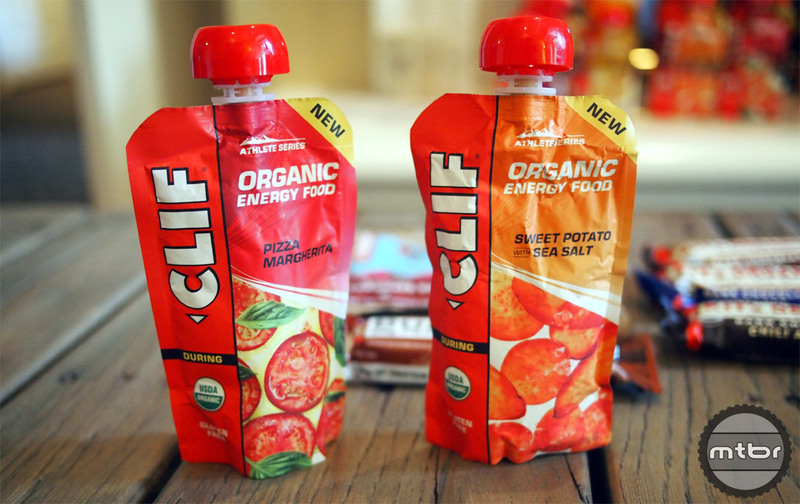 The Clif Bar Organic Energy Food Sweet Potato with Sea Salt and the Pizza Margherita flavors come in a larger 120 grams pouch (larger than the sweet flavors) and retail for $2.99 from specialty retailers starting now. Clif defines specialty retailers as bike, run, outdoor and some gym retailers. They are currently not available in stores like Whole Foods, all though this may change depending on customer demand. New flavors are already being currently developed. Dark chocolate chili almond, dark chocolate walnut, dark chocolate peanut. 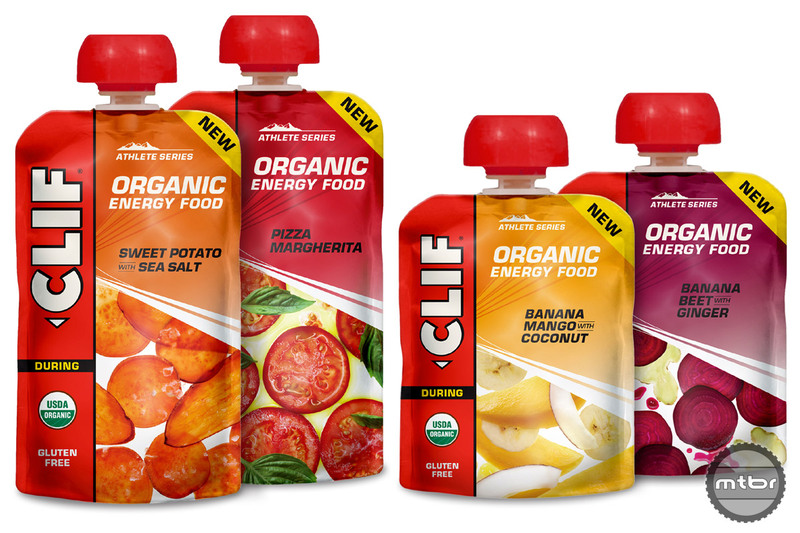 Besides the new organic energy food line, Clif Bar has also recently announced new flavors of the Clif Bar, Builders Bar and Kit’s Organic Bars. 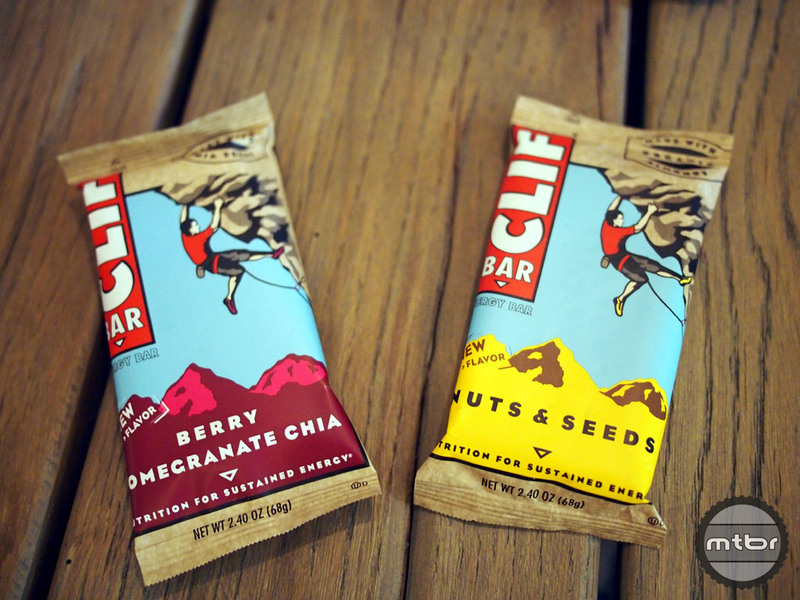 New Clif Bar flavors are the Nuts & Seeds flavor (less sugar, great nutrition profile) and the Berry Pomegranate Chia flavor. Chocolate Hazelnut is new flavor for the Builders bar, that has a taste very similar to Nutella. 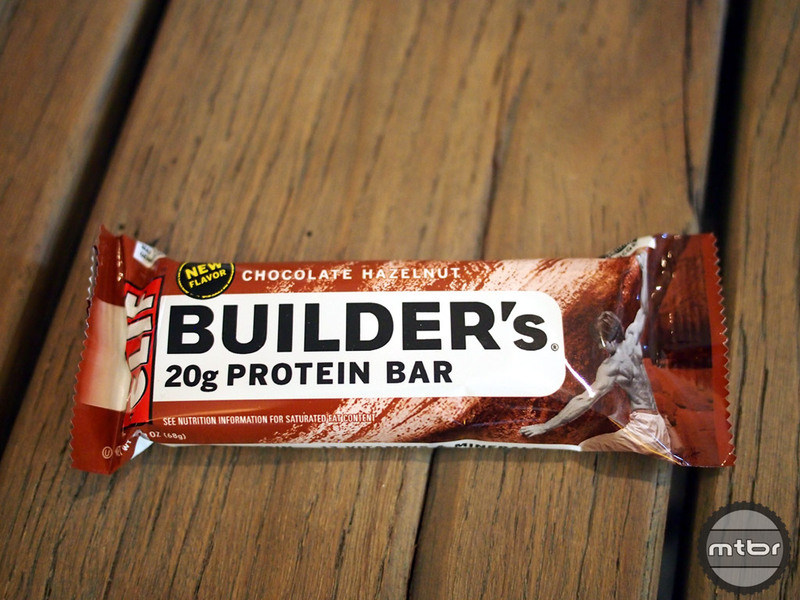 The Builders bars have 20 grams of protein so they are great for recovery. 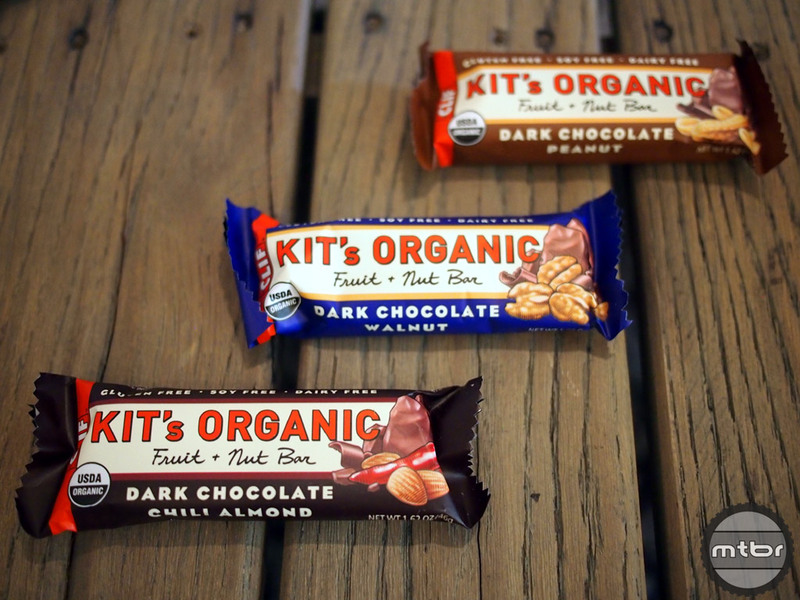 And lastly, there are 3 new dark chocolate flavors for Kit’s Organic bars. These are named after Clif Bar founder Gary Erickson’s wife, Kit, who is also a co-owner of Clif Bar. These are ruit and nut snack bars that are gluten-free, dairy-free and soy-free. The new flavors are: Dark chocolate chili almond, dark chocolate walnut, dark chocolate peanut. We had a chance to sample the pizza in a pouch flavor and while it may not sound very appetizing, the flavor is very much like a piece of Margherita ‘za. Of course, the fact that it’s not hot, doesn’t have the cheesy texture or the crunchy crust we have to say that the flavor itself is very much like a slice of cheese pizza. 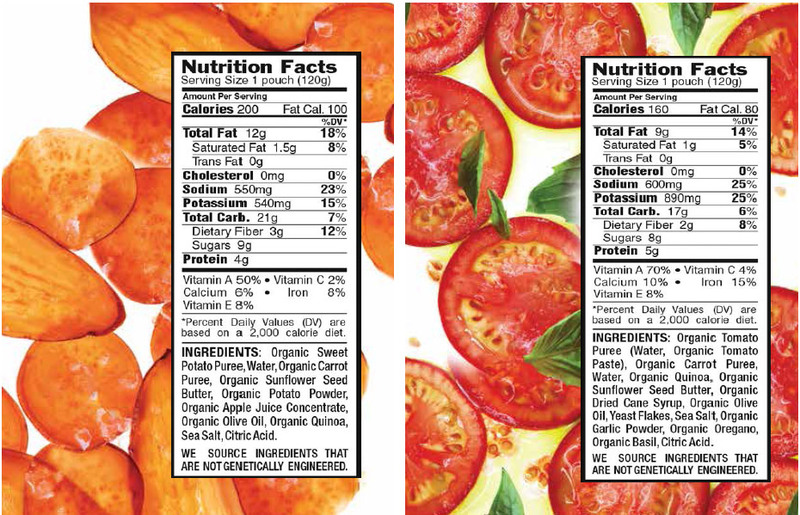 The tomato, garlic, oregano and basil flavors are legit, since these are actual ingredients in the pouch. Would we down a six pack of these with our favorite IPA while watching the big game? No. Would we eat this while riding the Flume Trail on a hot summer day with salt deposits encrusting the back of our jerseys? Yes. But remember, the two savory flavors are purposefully high in sodium, so don’t give them to kids and don’t eat them as a replacement for your short term ride “boost”. 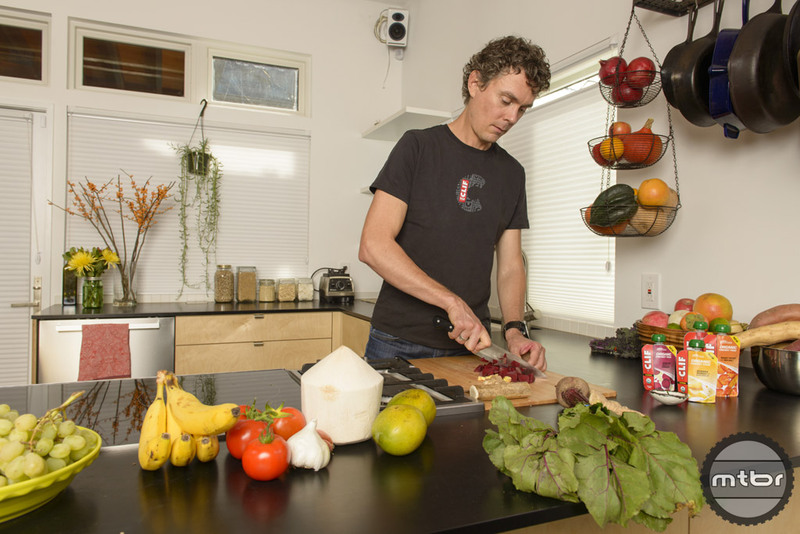 Endurance athlete and vegan, Scott Jurek in the kitchen with Clif Organic Energy food. Suggestion: Carry a slice of pizza. These are essentially baby food pouches, and those can be had for much cheaper while still being organic. I just feed the momma bird a slice of pizza and have her feed me like a little baby bird. @Seneb — baby food pouches are rarely over 120cal, and often less.